Joy Creek Photo Archive (c) all rights reserved New Zealand. 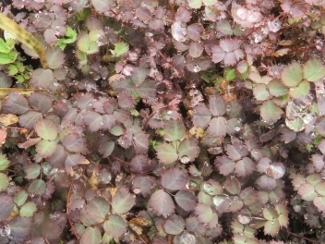 This attractive groundcover is distinguished by its small, rounded, purple leaves which are shown to their best advantage when contrasted with golden leafed perennials and groundcovers. They also are noteworthy when their color is echoed in nearby shrubs. Species inermis has soft round fruits that do not cling like those of other species and so this is a good choce of Aceana to put near paths or other well-traveled sites. Give this good drainage and good sunlight and it will flourish. We have found that it is somewhat drought tolerant.